Wolfmother frontman Andrew Stockdale may have been joking when he told the San Diego Tribune that his band sounded like “a mix of the playfulness of Earth, Wind And Fire with the intensity of Black Flag”, but he’s had the last laugh. His band’s highly acclaimed eponymous 2005 debut sold a hefty 1.3 million copies worldwide (scooping a clutch of industry awards along the way) and, despite a succession of line-up changes, Wolfmother’s authentically funky old-skool hard rock has continued to attract an ever-growing army of devoted disciples. Born in 1976 and primarily raised in Brisbane, the capital of the Australian state of Queensland, the afro-sporting Stockdale was turned on to hard rock, heavy metal and psychedelia at an early age and quickly became an accomplished guitarist. Yet, by the turn of the 21st Century he was eking out a living as a photographer in Sydney, when he met graphic designer Myles Haskett, also an aspiring drummer. Haskett then introduced Stockdale to bassist/keyboardist and digital designer Chris Ross, and the trio began to jam in private outside of their day jobs. The newly christened Wolfmother took their time learning their craft, jamming away unhindered while their sound took shape. After some deliberation, the band finally took the plunge and played their first live show on 14 April 2004 at the Hopetoun Hotel in New South Wales’ Surry Hills, and from there they proceeded to play a series of shows in and around Sydney, creating a local industry buzz in the process. By August that same year, Wolfmother signed with Australian label Modular, who packed them off to record their self-titled debut EP at Ghetto Studios in Detroit, with producer Jim Diamond (famous for overseeing The White Stripes’ first two LPs). A spirited, psychedelic-tinged affair, Wolfmother featured early, slightly formative versions of key cuts from the band’s 2005 eponymous debut LP (‘Dimension’; ‘Woman’; ‘White Unicorn’), was well-received by the critics and climbed to No.35 on Australia’s ARIA Singles Chart. Encouraged by their initial disc’s performance, the band gigged relentlessly for six months, tightening up their act and honing their arrangements prior to once again decamping to the US, where this time they hooked up with Oasis/Jet producer David Sardy and knuckled down to recording their eponymous debut LP. Band and producer laboured over pre-production, rehearsing solidly for six weeks at Hollywood’s Cherokee Studio, before relocating to Studio City, Van Nuys, the same complex that Nirvana booked into to record Nevermind with Bruce Vig. With Stockdale and co right on top of their game, the sessions wrapped in just two weeks and the album was ready for release on 31 October 2005, by which time Wolfmother’s first double A-side single, ‘My Mind’s Eye’/‘Woman’, had already peaked at No.29 on the ARIA singles chart. Wolfmother was also an instant hit in Australia, where it entered the ARIA Top 40 at its peak position of No.3, and featured in the charts until mid-2007, by which time it had been certified platinum five times over. Largely positively received by critics, who heard echoes of pioneering hard-rock/heavy metal albums such as Led Zeppelin II and Black Sabbath’s Paranoid in the best of the record’s ballsy, impassioned anthems, Wolfmother also did good business abroad. Charting at No.25 in the UK and at No.22 on the US Billboard 200, it earned gold discs in both of those countries, as well as in Canada and Germany. With Wolfmother eventually selling 1.3 million copies worldwide, the band’s momentum continued to build throughout 2006. During March, the album topped the Readers’ Top 10 Albums Of 2005 Chart in the influential North American rock magazine Rolling Stone, while the band wowed crowds at most of the significant summer festivals, including Roskilde and the Reading/Leeds Festivals in Europe, and at Lollapalooza and Coachella in the US. More accolades followed. When the legendary Led Zeppelin were inducted into the UK Music Hall Of Fame in November 2006, they very publicly endorsed Wolfmother, inviting Stockdale, Ross and Haskett to appear as their special guests and perform ‘Communication Breakdown’ – one of the many highlights from Led Zep’s debut album, and a song which frequently featured in Wolfmother’s live set. The band then won further mainstream acceptance when their critically acclaimed 45 ‘Woman’ scooped the Best Hard Rock Performance prize at February 2007’s prestigious Grammy Awards. Wolfmother tirelessly promoted their debut album, but rumours of a split in the ranks persisted and, after a performance at Australia’s Splendour In The Grass Festival, Myles Haskett and Chris Ross both quit to form a new band, Palace Of Fire. Stockdale soldiered on, however, recruiting second guitarist Adrian Nemeth, drummer Dave Atkins and multi-instrumentalist Ian Peres, who took over Ross’ John Paul Jones-esque role on bass and keyboards. This new line-up bedded in freshly written tracks with well-received performances at benefit shows for Sound Relief (supporting victims of Australian bush fires) in March 2009, before heading back to California to record their second album, Cosmic Egg, with Alan Moulder, whose impressive CV includes productions as disparate as Ride’s Going Blank Again, The Killers’ Sam’s Town and Shakespeare’s Sister’s Hormonally Yours. Moulder proved an inspired choice, helping the band fashion a modern rock record that not only crackled with contemporary energy, but was also admirably wide in scope. Both Stockdale’s gut-level wail and the band’s hallmark monolithic riffage were present and correct on tracks such ‘California Queen’, ‘New Moon Rising’ and the album’s blistering first single, ‘Back Round’, but elsewhere Wolfmother came on like a groovier, heavier Free on the infectious ‘White Feather’, alchemised some ‘Dear Prudence’-esque psychedelia on the dynamic ‘In The Morning’, and even conjured up a credibly world-weary almost-ballad courtesy of ‘Far Away’. 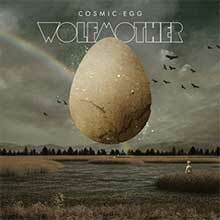 Released in October 2009, Cosmic Egg again received positive critical notices, and the band embarked on the gruelling 113-date New Moon Rising world tour, which also took in a series of arena shows supporting AC/DC on their Australian tour of February 2010. The jaunt was truncated, however, when Wolfmother were forced to cancel the European leg owing to illness and exhaustion, yet their efforts ensured that Cosmic Egg again performed well on the global stage. Rising to No.35 in the UK and cracking the Top 20 of the US Billboard 200 (where it peaked at No.16), it also obtained another No.3 placing at home in Oz, where it was eventually certified platinum. During the New Moon Rising jaunt, ex-Mooney Suzuki drummer Will Rockwell-Smith replaced Dave Atkins on the drum stool and Wolfmother saw out the rest of 2010 with performances at North America’s prestigious Lollapalooza travelling festival and a brief maiden tour in Indonesia. By 2011, they were debuting new material such as ‘On The Beach’ and ‘Year Of The Dragon’ live, and had embarked on sessions for a new album. As 2012 rolled on, however, Wolfmother underwent further line-up changes, with Vin Steele replacing Adrian Nemeth, Hamish Rosser (ex-The Vines) taking over from drummer Rockwell-Smith and multi-instrumentalist Elliott Hammond also joining the ranks. This new line-up took to the road almost immediately, debuting new songs ‘Keep Moving’ and ‘Of The Earth’ during a European tour, yet despite suggestions that an LP – provisionally entitled Gatherings – was due for release, no new material surfaced until 2013. But instead of this elusive third Wolfmother LP, Andrew Stockdale’s debut solo outing, Keep Moving, was issued in June 2013. A Wolfmother LP in all but name, it featured contributions from Rosser, Peres, Steele and Hammond, and it showcased plenty of the band’s trademark raunchy hard rock, as well as gentler, folk-flavoured fare such as the delightful ‘Black Swan’ and the mellow, Arlo Guthrie-esque ‘Suitcase’. Though released with relatively scant promotion, Keep Moving nonetheless rose to No.32 in Stockdale’s native Australia, but it had barely hit the racks before Wolfmother were back in action and touring California in June 2013 – albeit without the departing Eliott Hammond, but with temporary incumbent Tony McCall replacing Hamish Rosser behind the kit. The band again began working on new songs, though a further line-up change occurred after Tony McCall chose to remain in the US. A new-look Wolfmother, with the versatile Vin Steele on drums, finally settled down to record the band’s long-overdue third album, mostly at Stockdale’s own studio, The Shed, in New South Wales’ Botany Bay, during the last few months of 2013. The album that emerged, New Crown, was very much an independent exercise. Stockdale occupied the producer’s chair and Wolfmother initially released the completed album as a digital download through Bandcamp, in March 2014. 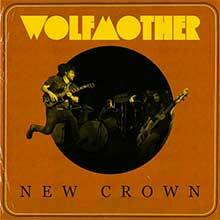 But demand for a physical counterpart was high and, during August 2014, New Crown was issued on both CD and limited 12” vinyl, through Wolfmother’s online store. A swaggering, no-holds-barred garage-rock album, New Crown included several tracks (‘Tall Ships’; ‘How Many Times’; ‘She Got It’) which were undoubtedly up there with the band’s very best. Critics and fans united to sing the album’s praises and, despite minimal promotion and marketing, New Crown sold solidly, even peaked at No.160 on North America’s Billboard 200. Andrew Stockdale has since continued working with Ian Peres and, during 2015, the pair teamed up with top-flight producer Brendan O’Brien (Bruce Springsteen; Pearl Jam) to craft their hotly anticipated fourth album Victorious. Recorded at Jim Henson Studios (formerly the old A&M Studios) in Hollywood, the sessions also featured powerful contributions from two highly regarded drummers, Josh Freese (Guns N’Roses, Nine Inch Nails) and Joey Waronker (Beck, R.E.M.). Boasting the storming title track and the streamlined and super-catchy ‘City Lights’, it once again finds Stockdale and co working at the height of their powers. Embarking upon an extensive touring schedule following its release, Wolfmother are set to unleash a feral howl like never before. There's no denying Australian heavy rock trio Wolfmother has been raised on rock -- specifically, raised on '70s rock. Problem is, from all appearances on their eponymous debut, they made their journey into the past via the twin gateway drugs of the White Stripes and Queens of the Stone Age, and once they dug back to the original Zeppelin and Sabbath texts (stopping along the way for some Soundgarden discs and maybe, for lyrical inspiration, Yes and Rush), they indulged so much it screwed with their sense of aesthetics. They threw everything and anything together, not bothering with minor problems like how their frenzied retro-rock doesn't quite support songs with titles like "The White Unicorn" and "Where Eagles Have Been" -- Zeppelin drew inspiration from J.R.R. Tolkien and Sabbath certainly sang about fairies and gnomes, but neither band sounded as precious, inarticulate, or confused as Wolfmother does here. And their naïveté is not limited to guitarist Andrew Stockdale's stock swords 'n' sorcery imagery: they mix up their musical clichés in bewildering ways, as riffs lifted from Soundgarden ("Rusty Cage" provides the opening for "Joker & the Thief") give way to a QOTSA stomp as sung by Jack White (whose ghost is also heard on the title of "Apple Tree," not to mention its frenetic verses), or how a complicated Zep riff is graced by a Jethro Tull flute solo on "Witchcraft." Blame it on their youth -- all this stuff was new to them, so they absorbed it all at once then quickly regurgitated it in ways that won't seem to make much sense to anybody familiar with their inspirations (and their clunky funk-rock workout "Love Train" simply won't make sense to anybody anywhere). 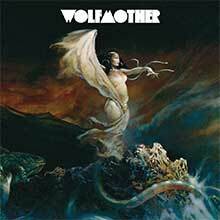 At times, Wolfmother's unintentionally bizarre amalgams are kind of delightful, and the group does have a basic, brutal sonic force that is pretty appealing, but even at their best, they never banish the specters of the bands that they desperately mimic throughout this promising but muddled debut. They have enough of a good thing going here to suggest that they'd be a killer live band, but not enough to make this record all too memorable on its own terms. Swapping out his rhythm section, Andrew Stockdale proves beyond a shadow of a doubt that he's the mastermind of Wolfmother on Cosmic Egg, creating a second record that is essentially a replication of the first, equally enamored with all the thick, heavy rock of the '70s, specifically Sabbath and Zeppelin, tempered with a little bit of Jack White caterwaul. All the sounds remain the same, but the songs have changed: with the occasional exception, such as the Stripes-ian salute "White Feather," Stockdale backs away from simple, brutal riff-driven songs, preferring churning exercises in heavy fantasy, sometimes colored with some Deep Purple organ. It's an effective way to show off a tighter, capable band, one that can deliver a serious gut-level punch, and one that is spending more time fusing their influence than delivering straight-up hero worship. Released without fanfare roughly five years after Cosmic Egg -- and about a year after leader Andrew Stockdale released Keep Moving on his own -- Wolfmother's third album, New Crown, didn't create a media splash, maybe because they're no longer the "next big thing," but rather workingman's rockers. Stockdale is the opposite of Jack White, the rocker he was so often compared to after his first album. White finds new wrinkles in his old template, whereas Stockdale is very happy to dig down deeper into his favorite Sabbath and Zeppelin riffs, kicking up the boogie a little bit harder than those two titans but still favoring fuzz and caterwauls that can't help but bring back memories of gatefold LPs. Depending on your view, this is either his blessing or curse. It's easy to dismiss Stockdale -- who, at this point, is all that Wolfmother is -- as a mere retro-monger, but he has skills as a trashman, creating irresistibly fuzzy squalls of noise and hooks that catch the skin. His greatest detriment is his voice -- it's all yelps, lacking the subtle textures of Ozzy Osbourne -- but he knows when to bury it under guitars, which he often does on New Crown. It's not enough to change the minds of doubters, probably because Stockdale is now totally comfortable doing what he does and nothing more, but that swagger and defiance makes for a cracking little rock & roll record. 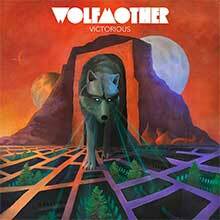 Victorious is the upcoming fourth studio album by Australian hard rock band Wolfmother. Recorded at Henson Recording Studios with producer Brendan O'Brien, it is due to be released on 19 February 2016 by the Universal Music Group.